Looking for a heavy thriller, mystery drama but not strong enough for OCN’s dramas? Look no more! 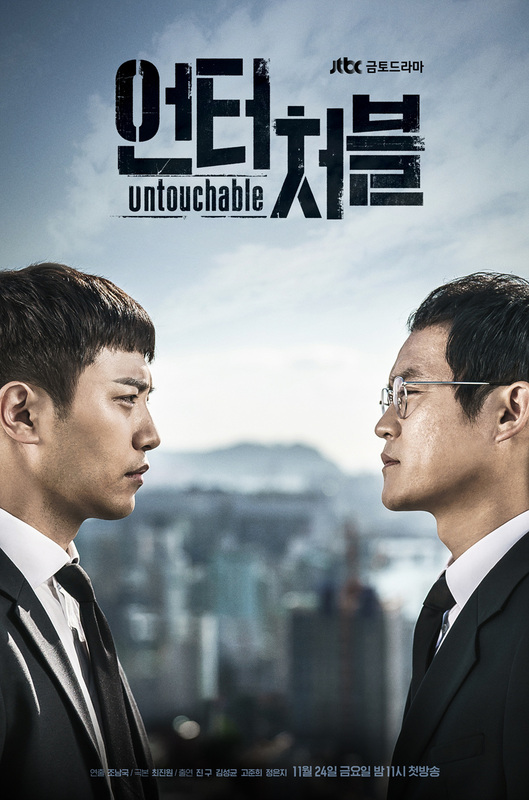 JTBC offers your Untouchable. A gory drama but not as gory as OCN’s. Untouchable aired from Nov 2017 through Jan 2018, successfully made me cursed few times due to frustration. Several characters were really evil and what’s worse is, we know those characters might actually exist in real world. Set in Bukcheon, an imaginary city, the Jang family held the highest power there. Jang Beom Ho (Park Geun Hyung), father of Jang Ki Seo (Kim Sung Kyun) and Jang Joon Seo (Jin Goo) was one scary man. He wasn’t a human. He was a monster pretended to be an angel in front of the citizens of Bukcheon. He was the city’s mayor. Controlled the city with power and cruelty without his citizens knowing. His dictatorship drove him doing such hideous thing i.e setting up a private island to “punish” criminals (as seen in ep 16). No wonder the crime rate in Bukcheon was low during his term. Jang Ki Seo, the oldest son but a weak one. All his life he lived under his father’s shadow. Married to a powerful woman, daughter of the previous president, Goo Ja Kyung (Go Joon Hee) but their marriage was loveless. After his father’s death he ran for the mayor. After his father’s death he was practically #1 person in Bukcheon, right? But even when he was preparing for his run he still imitated his father’s way of speech and all. Thought he could break free but he was wrong. He couldn’t help it. Let’s just say he lived such a miserable life. Jang Joon Seo, the youngest son, ditched his evil father and became a cop in Seoul. Married to a woman and was madly in love with her. One day his wife was killed and coincidentally all hints he found all pointed to Bukcheon. Like someone planned all these to bring Joon Seo back to Bukcheon. So he came back to his hometown only to find out the dirty secrets of his family. Untouchable was one heavy drama filled with family secrets, gangster violence, and power play just to name a few. If you’re not into it don’t watch it. It’s not as gory as Bad Guys season 1 (OCN, 2014) but still gory and definitely not suitable for those below 15. Jung Hye’s death was only the tip of iceberg of Jang family mystery. Her death had many secrets and if Joon Seo didn’t dig it, the wrong doings of Jang family wouldn’t come to the surface at all. Not helping at all, all citizens of Bukcheon admired and kind of workship Jang Beom Ho. The “unwritten law of Bukcheon” was emphasized all throughout the drama. This actually shaped the character Jang Beom Ho. Because of this law we got the idea how scary this man was. The story was heavy. It really demanded me to concentrate all the way until the end. The story was complex. It had many cover ups and dirty tricks, betrayals, mind game was strong and extreme violence. I felt overwhelmed once in a while too. So many facts just kept popping up every now and then. The story was tight from start to finish. It literally didn’t give you time to catch your breath. It developed from “I want to know if my wife ever loved me or not” to “damn my father is actually a monster”. Yes, that happened. The mystery rapidly evolving. Every episode was filled with surprises. It actually moved at rather fast pace for a mystery drama. But what the writer did great here is that he could make every episode new and not suffocating. Everyone was hungry for power in this drama. Majority of dramas like this fail to make it fresh and they all feel repetitive. But Untouchable somehow didn’t feel like it at all. If I can point out the downside of this drama, well there were many, many, I mean, manyyyyyyyy characters in this drama. Too many faces and names. They all appeared all at once. I failed several times to connect with their conversations because I was busy wreaking my poor brain trying to remember the person they just mentioned and what connection that person had in their conversation. But other than that everything was good. EP 3. Still hard for me to process the story. Too many names and faces. Ep 13. This episode was somehow very disturbing for me. Ep 14. Even up to this point, I still didn’t know who was the one with the most power. The power seemed like being transferred from one to another. It’s still very confusing to point out who actually held the highest power at this point. Ep 15. Still very complicated. I didn’t think everything would be solve in episode 16. Ep 16. Uh waw. Not as compact as I thought I would be. It was rather easy to digest. In this episode we clearly see how evil Jang Beom Ho was. I got goosebumps when he said “I am not Jang Beom Ho. I am a God”. Crazy! Jang Jeon Seo, your regular crime thriller lead male. The most boring character out of all if I can say. He was always straightforward. He was himself, his character didn’t have layers. 90% of the time you know exactly what he was gonna do. But he’s the reason why the dirty secrets were revealed. Jang Ki Seo was very difficult to guess. One time he was Jang Joon Seo’s eternal enemy but the next second he was soft to Jang Joon Seo. He also loved his wife, Goo Ja Kyung but at the same time he had an affair with Yoo Na Na (Ji Yoon Ha). He didn’t appreciate Goo Ja Kyung but felt sorry towards her. He did something very bad to Yoo Na Na but still longed for her. Until his very last moment, I still couldn’t predict Jang Ki Seo, andddddd Goo Ja Kyung, honestly. They both were never clearly black or white. They were gray all the way until the end. One time they were good the next they were bad. Their characters might look all clear and easy to understand, but honestly they were really complex. Beside Jang Ki Seo, I also pitied Goo Ja Kyung. She got into a business marriage and didn’t even realize her own feeling to her husband only to know it at the very end. But beside that, she was one strong baddie. She was independent. She knew she had strong influence over the committee members and made very good use of it. Both Jang Ki Seo and Goo Ja Kyung were pitiful. But during their days they managed to stand tall in everywhere theywere during their lives. Next confusing character is Yoo Na Na! Just like Jang Ki Seo I didn’t understand her character. She was hurt by Jang Gi Seo but until the end he loved Jang Gi Seo I guess love is hard to predict, uh? At first I was irritated by Seo I Ra (not because of Jung Eun Ji – I think she’s one of the better idols who do acting). For me this character broke the flow as Seo I Ra was more fitted in a rom-com/light drama instead of noir, thriller like Untouchable. But as the episode went on I think it was brilliant to have Seo I Ra as a carefree prosecutor. She got deep into the mystery and her character became more mature. She became the independent prosecutor who only sought the truth. Bravo to her character development! Everyone was great, no exception. Waw, this is actually the shortest comment I’ve ever had for this section. Not as sleek as regular public broadcast dramas but still great. Many shots emphasized how spacious their set was i.e. Untouchable was one solid drama. Definitely give it a try! I give it 10 out of 10!